► Sign Up and Save! Independently owned family business that thrives on quality service and the highest quality produce. We are open 7 days a week, offering the local community farm fresh fruits and vegetables, specialty grocery items, artisan bread, dairy, local honey, gourmet bulk foods and a variety of other local grocery products. We offer a variety of sweet and savory pies – both freshly baked or frozen – so you can enjoy immediately or serve later for that special occasion. Give the gift of healthy, fresh produce. 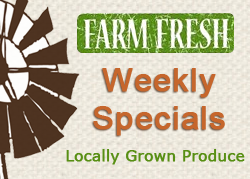 Purchase from our large selection of organic, local and fresh produce, as well as our specialty grocery products. Looking for a great recipe? Our recipe of the Month features a healthy and delicious recipe selected by our staff for you and your family to enjoy. Error: The video (https://www.youtube.com/watch?v=QX8xBqbw2vQ) couldn't be embedded. Error: The video (https://www.youtube.com/watch?v=QIVTEQPpcgw) couldn't be embedded. Pleasant Hill Market is a family owned business that thrives on quality service and the highest quality produce. Each day we purchase the freshest in locally grown produce and strive to insure that we provide our customers with the finest selection of the season. Come see our large selection of farm fresh fruits and vegetables, locally produced specialty grocery items, artisan bread, dairy, local honey, gourmet bulk foods and a variety of other grocery products. To receive weekly notifications when we have special discounts on produce and other artisan grocery items, please submit your email address in the field below.